Tron should be watched out for in 2019. Here is why. Tron’s founder, Justin Sun has over the years shown his steadfastness and believe in Tron and is now out to improve the value of its native token, TRX. The coin is also one of the best performing cryptocurrencies so far in 2019 making it safe to say that Tron should be watched out for in 2019. All the decentralized applications that are being developed on the Tron blockchain requires the use of TRX tokens which has had a very postive impact on both Tron’s development and its price. Since the launch of Tron mainnet in May 2018, the network has seen exponential growth. 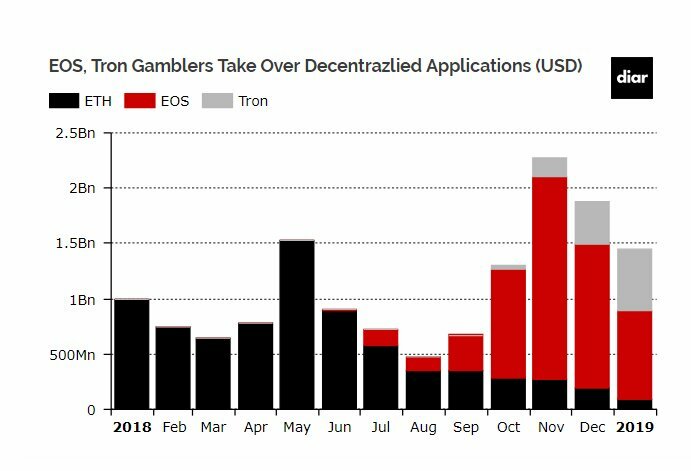 Within the past 2 months, the number of decentralized applications developed on the Tron blockchain has increased by over 100% surpassing the number of Dapps created on EOS and the Ethereum network. TRX holders can always receive airdrops for coins that is launched within the Tron blockchain. This is unlike the Ethereum and Stellar blockchain, where their holders are to participate before they could earn airdrops. This gives TRX holders the opportunity to earn more airdrops depending on the amount of TRX they are holding. With this initiative, we could see a rise in the number of people who buy and hold coin leading to an increase in its price. A recent example of this is the allocation of BitTorrent tokens (BTT) to Tron holders. Given the current bear market, some big names within the crypto space such as Shapeshift and Bitmain are laying off some of their staff so as to cut cost. However, Tron is embarking on growing its team. Between March and Dec 2018, Tron has increased the number of its blockchain engineers from 3 to 40, more than a 2000% increase. The price of Tron has been rising over the past few months. Since August 2018, the coin has been increasing constantly in price making it one of the only (top) cryptocurrencies. The coin is currently ranked 8th in terms of market capitalization and could easily get ranked 4th everything being equal. In the last two months, its market capitalization had moved from about $953 million on Dec 4th 2018 to about $1.7 billion as of writing time, about $700 million addition and an increment by more than 50%. Here are our top 4 reasons Tron should be watched out for in 2019. New Data Shows That Ethereum (.. The Quadriga crypto exchange c..